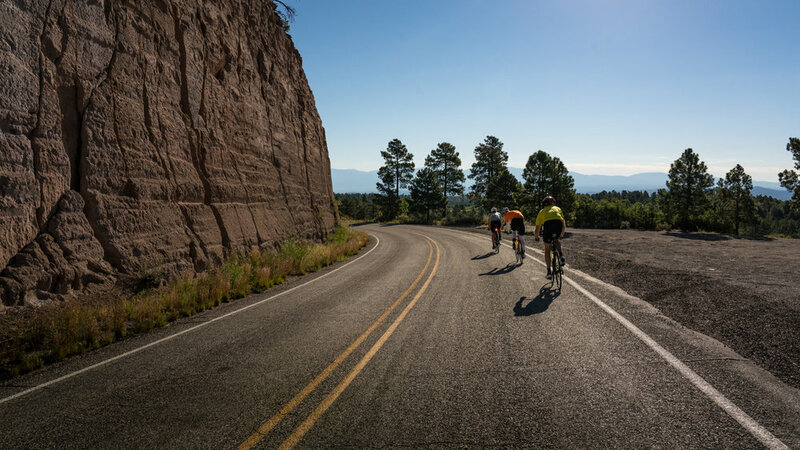 This might be one of the last places that comes to mind when it comes to American cycling destinations: New Mexico. Expansive deserts, forested highlands, soaring peaks, and deep gorges present a topographical playground for riding a bike. But beyond the features of the jaw-dropping landscape, New Mexico’s deep, diverse cultural history offers a rich travel and culinary experience surrounding our newest departure. This eight-day excursion into the Land of Enchantment navigates the towering Sangre de Cristo Mountains, climbs to famed Taos, and rockets over the mighty Rio Grande. It’s an adventure sure to leave your legs empty, heart full, and memory littered with treasures. The Jemez have lived in the Jemez Valley for hundreds of years and in Northern New Mexico for at least a thousand years. The Jemez People are primarily farmers, but also gather and hunt. After a 1-hour transfer from Abluquerque, we begin our ride from the Jamez Pueblo & Visitor Center, gradually climbing up through the Jamez Mountains. A quick side trip brings us to the Gillman Tunnels, built in 1920, hanging above the Guadalupe Box Canyon and the river below. If you have seen the movie ‘3:10 to Yuma’, you will recognize these scenic tunnels. The highlight of the day comes when we bend a corner and the grand Valles Caldera National Preserve comes into view. 1.25 million years ago, a spectacular volcanic eruption created the 13-mile wide circular depression now known as the Valles Caldera. The preserve is known for its huge mountain meadows, abundant wildlife, and meandering streams. From 8,700’ feet, we roll across the mountain plateau before descending down into the rocky canyons and mesas of Bandelier National Monument, this area has seen human settlements from around 11,000 years ago. From Los Alamos we descend through the White Rock Canyon, carved through basalt and tuff by the south-flowing Rio Grande River before we carry on into the Santa Clara Pueblo, where Pueblo potters are best known for their black polished and red polychrome pottery. 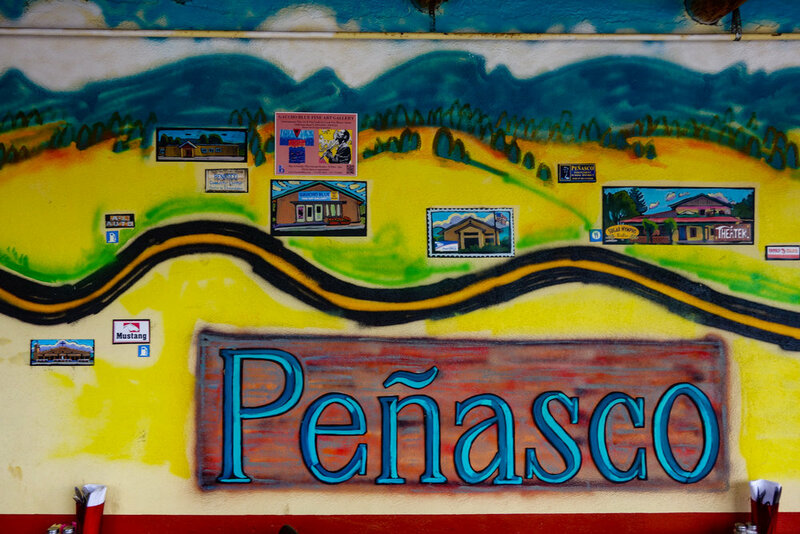 We will pass through the railroad town of Española, where the first European colony in North America was settled 400 years ago. I will pick up tacos at El Paragua restaurant along the way. From Española, we head deep into the arid and rugged El Rito Mountains, known as the pink mountains we will pass by the historic Ojo Caliente Hot-springs and through El Rito, one of the first Spanish settlements in Northern New Mexico, where we will visit the oldest church in New Mexico. We finish our nearly 100-mile day in the historic outpost of Abiquiú, the starting point of the pioneering route of the Old Spanish Trail, a team of sixty mounted men set off with pack animals and goods towards California in 1829, an eighty-six day journey. Artist Georgia O’keeffe lived nearby at her Ghost Ranch and she owned a small studio here in Abiquiú. Tonight we stay and dine at the Abiquiu Inn, set amidst some of the most pristine southwest landscapes in the USA. The modern casitas finished in southwestern design with Native American-inspired viga ceilings, a truly unique experience. 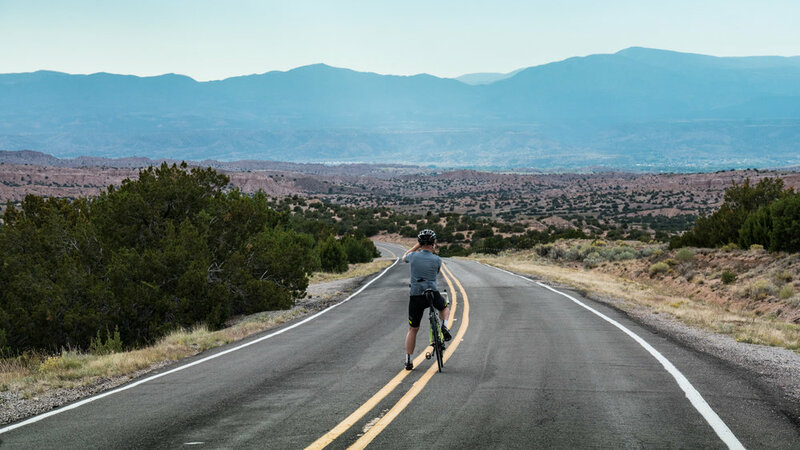 Anyone searching for solitude and mountain views will love todays ride through an unfamiliar part of New Mexico. A section of today’s ride, a 49-mile stretch of quite highway passes through the Carson National Forest, and climbs over the 10,507-foot Brazos Summit. This morning, we will visit the ancient Taos Pueblo, the multi-storied adobe village that has been continuously inhabited for over 1000 years. We will walk amongst the pueblo this morning before we head out on our adventure over the High Road towards Santa Fe. The High Road is a 50+ mile scenic, winding and quiet road through the Sangre de Cristo Mountains between Taos and Santa Fe. It winds through high desert, lush forests, high mountains, tiny farms and small Spanish Land Grant Pueblo Indian villages dating back to the 17th and 18th centuries. In October 1965, Arturo Jaramillo and his wife Florence envisioned a plan for the house built by Hermenegildo and Trinidad Jaramillo, and the Restaurante Rancho de Chimayó was born. Their restaurant would preserve the rich traditions of their family and its proud culture, welcoming guests into this comfortable and romantic piece of history. Fireplaces radiate warmth into cozy rooms and family photographs hang on the white washed adobe walls. The lovely terraced patio beckons you to exquisite outdoor dining. 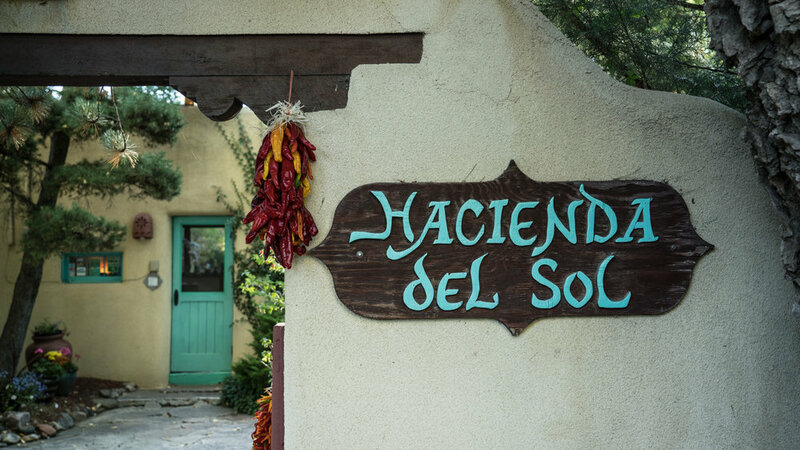 Join us at Rancho de Chimayó - a treasured part of New Mexico’s heritage and history and will always remain...a timeless tradition. El Santuario de Chimayo, a small shrine located in the Sangre de Cristo Mountains of Chimayo, New Mexico, has been a place of worship since before its construction in 1813. For generations, American Indians, Hispanics, and other people of faith have traveled to the site of El Santuario to ask for healing for themselves and others, and to offer prayers of petition and of thanksgiving for favors received. Following a long tradition of miraculous shrines, El Santuario is now one of the most important Catholic pilgrimage centers in the United States and one of the most beautiful examples of Spanish Colonial architecture in New Mexico. Today El Santuario de Chimayo, also known as Lourdes of America, attracts over 300,000 pilgrims from all over the Southwest and elsewhere each year. Thousands of pilgrims walk to El Santuario from Santa Fe and other starting points during Holy Week. We will have plenty of time to visit this special sacred space. Rise early this morning to take a morning walk amongst the Santuario in Chimayó and stop in for a visit to the Ortega’s Weaving, an iconic family store that has for generations, been producing authentic New Mexican wares. From Chimayó we descend down into the Pojoaque Valley, home to the Nambé Pueblo, one of the historic pueblos that participated in the Pueblo Revolt of 1680, trying to expel the Spanish from the area. We ride through small settlements before our gradual climb into Santa Fe and further up to the Santa Fe Ski Area, a local hill climb favorite. We climb through forests of ponderosa and aspen in the Santa Fe National Forests on the Scenic Byway, we will summit at 10,305’ above town. Enjoy the descent all the way back into Santa Fe or if your up for it, stop off at the Japanese Onsen- 10,000 Waves before we wrap up todays ride .